How to draft a Leave For Vacation Letter to your boss? We provide a perfectly written Leave For Vacation Letter that fits your needs! An (Annual) leave, or vacation is earned by eligible employees from the first day they start to work. Most companies allow their employees to receive credit for their earned leave on a (semi-)monthly basis, and the amount of leave days accrued is based on years of service. When you write the vacation leave request, be clear about what you are asking for at the beginning of the letter, including being specific in the subject line. If you will be taking hours that you have already accumulated and are due to you, state that. Briefly describe the steps you have taken to notify colleagues or clients. Make use of our leave for vacation letter template to help to come to a perfect personalized version. Firstly, check your organizations’ policy. Some firms require you to apply for your vacation leave months or weeks in advance. And also check the procedure on how to submit your request. It can help to get approval for your request, f you before you start to write the leave for vacation letter, check with colleagues, or any other stakeholders who will be affected by your absence, for their plans and see if they can help you taking care of your tasks for the time you are not available. Make sure that you also notify those who may be inconvenienced, like partners or customers. The objective of writing this letter is to request a period of leave for a temporary or permanent leave. It will mainly depend on the reason you apply for leave, whether or not you want to use a formal intonation. There are some companies that require an online form filled out and others accept an email. This leave for vacation request template could still help you out and you copy paste the content in your email or form. Make sure you request is complete with your dates of vacation and mention specifically it’s for vacation purpose. Check your grammar and spelling of the content that you added. Confirm if HR and your boss received (and read) it. Depending on your job description and level of responsibility, you may want to state where you will be, whether or not you will be checking phone, WhatsApp, WeChat, or email regularly, and how you can be reached in case of work emergencies. Please understand that if you are drafting a wrong leave letter or a false leave letter, this may create bridges of misunderstanding. Therefore, we recommend to first, analyze the reason behind the leave and then draft a letter accordingly. Make sure you have taken enough time to inform those who might be affected by your leave, so they can take the appropriate precautions. At the end of the letter, leave 4 lines for the signature between the closing and your typed name and formal title. Please note this template is provided for guidance only. Download this Leave Letter template to write a perfect (and personalized) letter, edited to fit your personal situation. 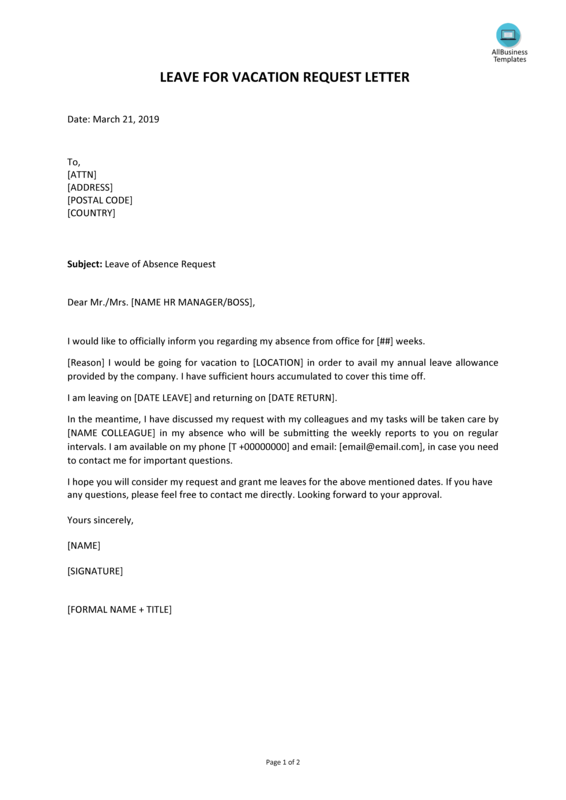 If this letter does not fit your requirements, please also have a look at the topic: Leave Letter Templates. I would like to officially inform you regarding my absence from office for [##] weeks. [Reason] I would be going for vacation to [LOCATION] in order to avail my annual leave allowance provided by the company. I have sufficient hours accumulated to cover this time off. I am leaving on [DATE LEAVE] and returning ......consider my request and grant me leaves for the above-mentioned dates. If you have any questions, please feel free to contact me directly. Looking forward to your approval.